Steve kindly came out to Constantia to take me to the airport. I chose to fly with Turkish Airlines as they had a direct flight taking 11 hours to Istanbul. Emirates always seem to stop in Dubai and once here in their huge airport, as a captive you are subject to ridiculous prices for everything . The fees for carrying a bike at Turkish were 89 Euro for the box, whereas Emirates charge a crazy $US70 or more for each excess kilo. They said the best thing to do was send it as freight. No thanks, I thought. The Turkish flight cost a little more but was well worth it. To my surprise, the plane was only half full so many of us had a few spare seats to spread out on and sleep during the overnight flight. The ensuing service was great, with staff looking after our every needs. 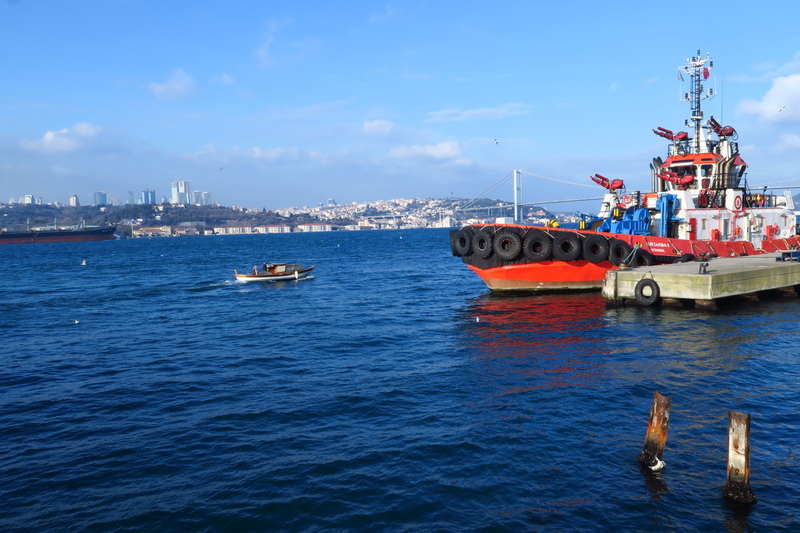 On arrival in Istanbul, formalities were effortless, arriving on a one-way ticket and getting the visa for 90 days were of no concern to authorities. Once outside the airport and into the coldest weather experienced since time in Cerro de Pasco in Peru. It must have been all of 1 degree, it was 0600 hrs. Luckily, I had packed a lot of warm gear in my carryon bag, so its effect was not as severe. 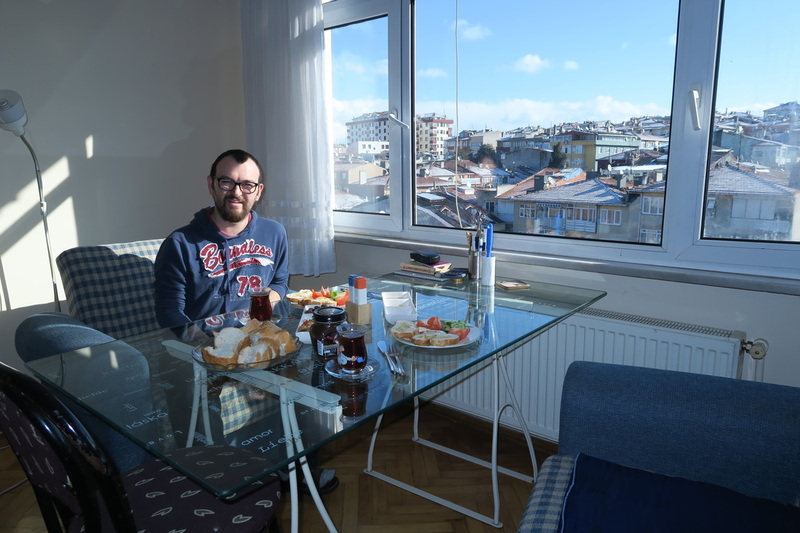 Suleyman, my Airbnb host had arranged to meet me at the airport. He had trouble locating me. After many Whatsapp texts and finally photos. Even pics of advertising outside where I was standing! He suddenly realised I was at the other international airport. He was at The Sabiha Goken airport. 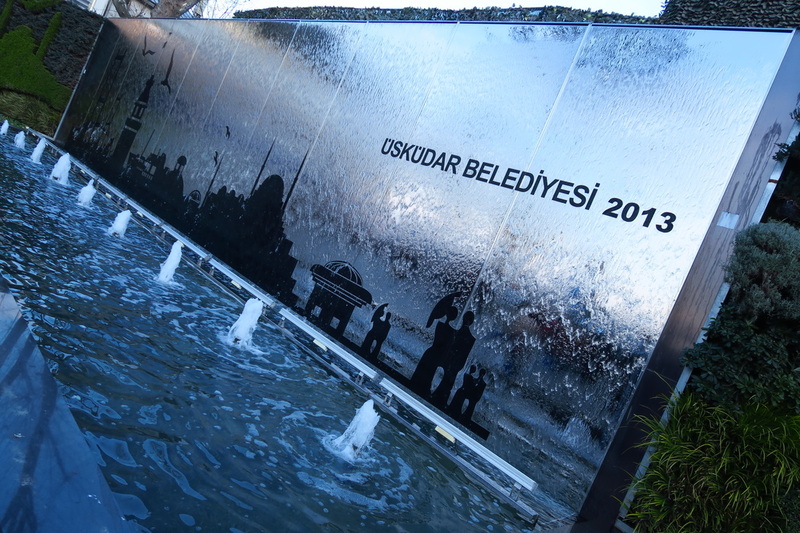 I was at Ataturk. We both laughed, he had to get to work. I confirmed the price of a taxi and found one that charged the price, that being 100Lira. 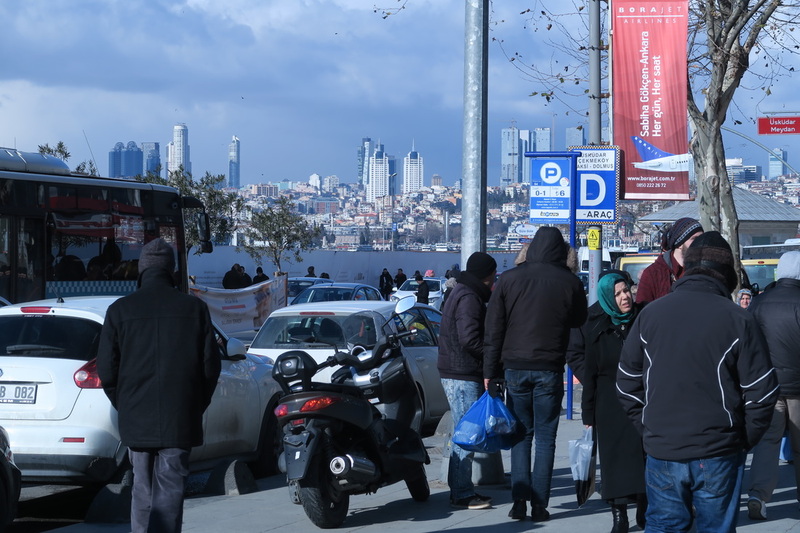 Suleyman said wait until 1100 when the traffic lightens up somewhat. Once at his apartment alongside the huge Karacaamhet Mezarliği cemetery in Űskdar, I lugged the gear up 4 flights of stairs, having got the keys off the market owner down the street. It was great accommodation with easterly views over the snow-clad roofs. Once settled in, it was time to do a little exploring and getting my bearings as to where the apartment was. The first stop was a little eatery about the size of a big car inside, on the main road in Uskudar that leads down to the water front . Here 3 guys about my age were cooking pots of rice and met balls with potatoes and other veges accompanied with bread at the tables. A hearty plate was 5 Lira or about $A2.50. They were a bunch of very friendly characters. The language barrier is going to be a challenge but by no means unsurmountable. We chatted as much as we could. I then went next door to a teahouse that their brother owned. Here they introduced me to a man that could speak some English. It was a mens only affair. This tradition, and the call to prayer coming from the many mosques, small and large in the area made me think back to days in Eqypt and Sudan. I am comfortable with this. It gives an atmosphere of mystique. It is almost a familiar sound for me. I only have good memories of Muslim countries. The pace in the narrow streets is very relaxed, no one is in such a hurry, this I enjoy. Everyone is rugged up with all manner of warm clothing and heavy street boots. After all we were walking around as it was snowing. An hour was spent over a couple of small bulbous glasses of black tea. That it comes in this glass keeps ones hands warm. 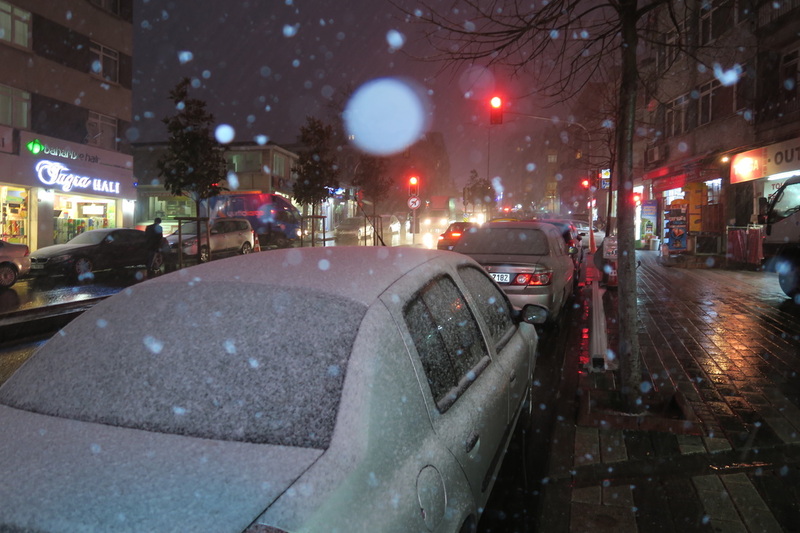 It was below zero outside with snow falling. The next two or three days were spent wandering about. Suleyman cooked up some lovely traditional dishes from his home in Central Turkey. I too cooked some of my specialties. Always having an Asian flare. 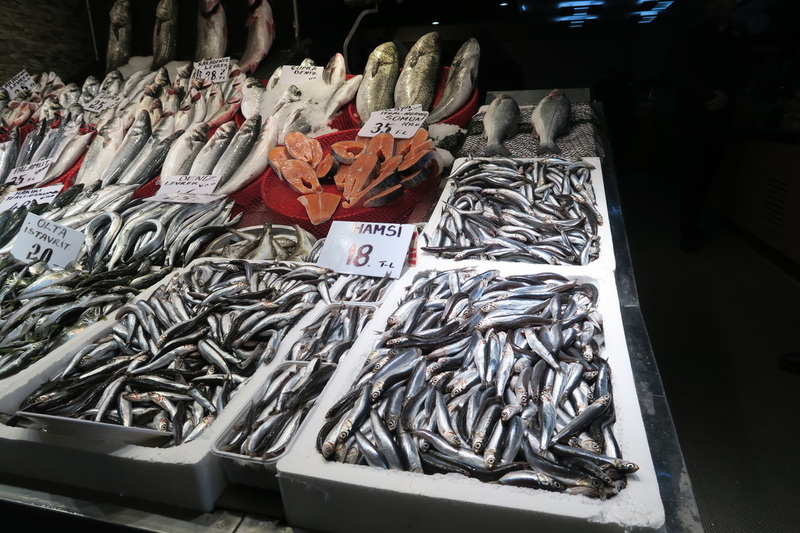 One night Hamsi, the small Black Sea fish were fried in cornflour, they are a staple here and delicious. It snowed on and off for the first 5 days here. 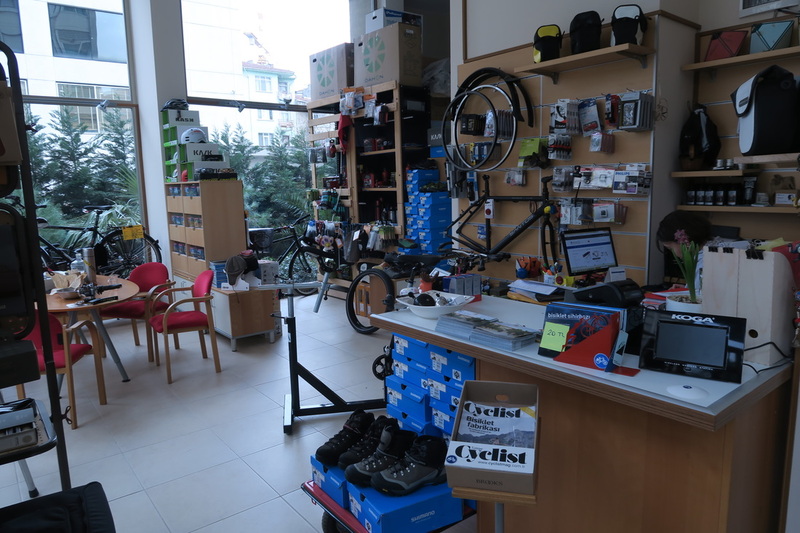 A visit wasmadeout to Biciket Gezgini in Kadikoy to get some parts required. Alex who runs the shop is a great guy and ever so helpful. Maps were bought here as well as a brilliant beany with head protection inside. My old Brooks seat needs replacing after 50,000km and four and a half years. He did not have the Brooks Flyer Special that was wanted. 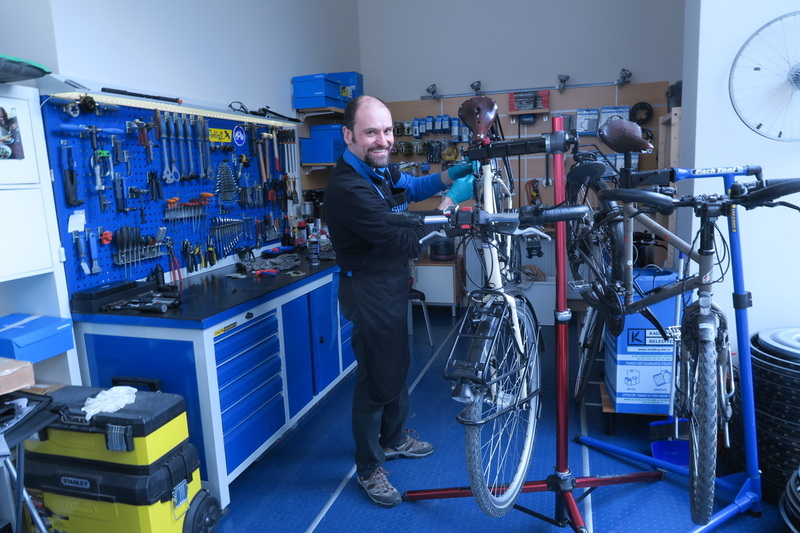 This bike shop is great for tourers and is somewhat of a focal point. Alex kindly shared some of his home cooked lunch with me. His contact details are: Ph. +90216 386 82 85. Just take a bus to Marmara University and he is walking distance from there on Camlitepe Street. Then my life took a turn of much change. One afternoon pains in my left side lower abdomen kicked in. It built up to an acute crescendo. I thought it was constipation or a diet change. At times, the pain became so bad it made me spew. After two days of this Suleyman took me to outpatients at a hospital near Kadikoy. I left here with some medicine and a diagnosis of constipation. Without Suleyman with me, it would have been such an ordeal to get this service. Almost no one spoke English. Even the young doctors knew almost none. This is totally understandable. There is no reciprocal health arrangement with NZ or Australia, so a fee of about $125 was paid. Very reasonable, I thought . Back at home, I felt alot better. Both physically and emotionally. It was such a relief to be out of pain. Though a dull ache still persisted. Next morning after bread. It came back with a vengeance. In this situation, all material things seem so insignificant and pointless. One just realises how important ones health is. I was walking around the house saying, “You can handle this Nige” over and over again. There was nothing I could do short of getting an ambulance to a private hospital. Having experienced kidney stones in the past, my pain threshold is quite high. This was getting up there though. Once again, as practiced in Kenya with similar excoriating pain. As, in the Buddhist way. In my mind, this pain was being suffered on behalf of all other people that suffer more than myself. For me this really eases the burden and comfortableness. That night on the floor in the loo, I was trying ease the pain by using enemas to stop the constipation. This did not work. Things were getting desperate. I had already booked a flight to London to catch up with Marco and his family. Cal and I rode with him in Chile three years ago. We had a great time together . He was one person whom I knew I would see again. I had other things to do there also, bicycle parts unobtainable at Bisiklet Gezgini, here in Istanbul. I told Marco I could not come because of the pain. He said get on the plane and I will take you straight to the hospital. I agreed, that night was another sleepless event due to the constant cycling of the pain. So luckily, early the next morning it had subsided. Suleyman helped me to a taxi at 0530 to catch the airport bus. I was on my way to the UK. A mercy dash of sorts. Alex from Bisiklet Gezgini, a man who loveshis work! My Airbnb host, Suleyman. He has been so good to me during this difficult time. These little fish are delicious fried in cornflour and egg. A fine, warm day, though only 7 degrees. I am slowly getting acclimatized. 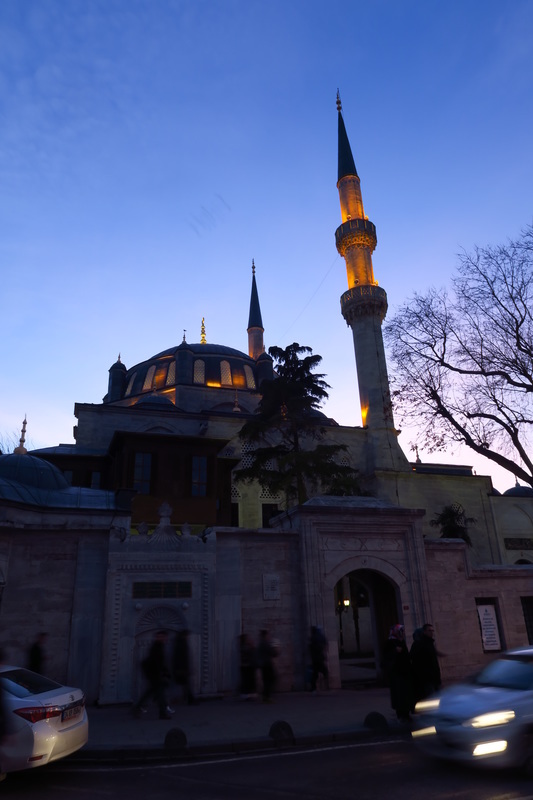 The largest mosque near my apartment, a beautiful building.